On a beautifully sunny day in Dublin, Mr Fluff and I set off for the west, and a grey and drizzly Galway. 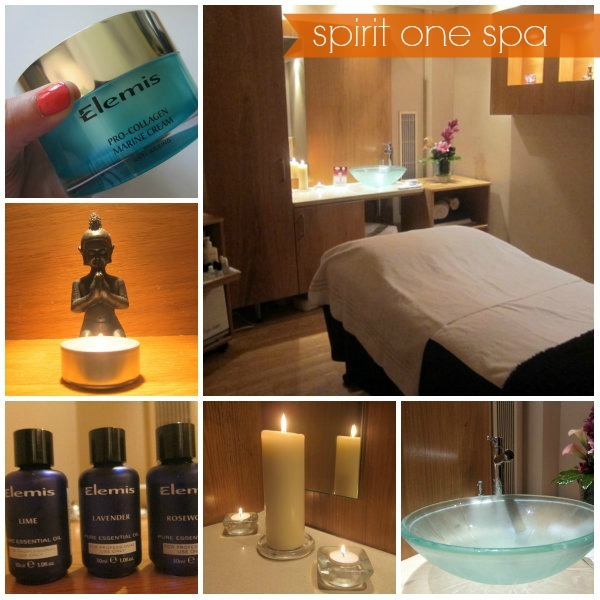 But we didn’t mind a bit, because we were headed for a weekend of sheer escapism at the Radisson Blu hotel, in celebration of the 10th birthday of the spirit one spa. It was a double birthday celebration, because one of the most iconic products from luxury spa brand Elemis is also celebrating its 10th anniversary. The Pro-Collagen Marine Cream is a hero product for this results-driven brand – one is sold every minute around the world. It’s clinically proven to not only reduce the appearance of fine lines but also to increase moisture and hydration levels in the skin. Music to my thirsty mug’s ears! To showcase its nourishing ways, the cream has been incorporated into a special version of the Elemis Pro-Collagen Quartz Lift Facial at spirit one. The treatment (hailed as its favourite by Grazia magazine!) is pretty damned special as it is – it can reduce wrinkles by up to a staggering 94%, and improve skin firmness by up to 57%. After just ONE facial! And I found it very, very good indeed. A combination of lifting massage techniques, and gorgeous Elemis products, works to plump and smooth the skin, promoting cell regeneration and the production of collagen in the skin. The treatment also incorporates the new Elemis Pro-Collagen Cleansing Balm, along with the Pro-Radiance Cream Cleanser, for a really deep and through cleanse. The balm is absolutely gorgeous – it melts on contact with the skin, which allows the essential oils to soothe and calm and remove all traces of makeup and impurities. I’ll be reviewing it soon, so watch this space. As if all that wasn’t blissful enough, I spent the rest of the afternoon lounging around the thermal suite, which is pretty spectacular – as well as the pool and various sauna and steam rooms, the outdoor hot-tub really sets this place apart. Don’t miss the ‘beach room’, which will transport you to more tropical climes in a jiffy – just lie back for 30 minutes on the warm sand, under a dawn-to-dusk light therapy cycle. I brought my book! The hotel itself is stylish and modern, located smack bang in the city centre just a few minutes walk from Eyre Square.With the loveliest views over Lough Atalia and Galway city, a Nespresso machine and the comfiest bed in the world, our room was the perfect home-from-home. 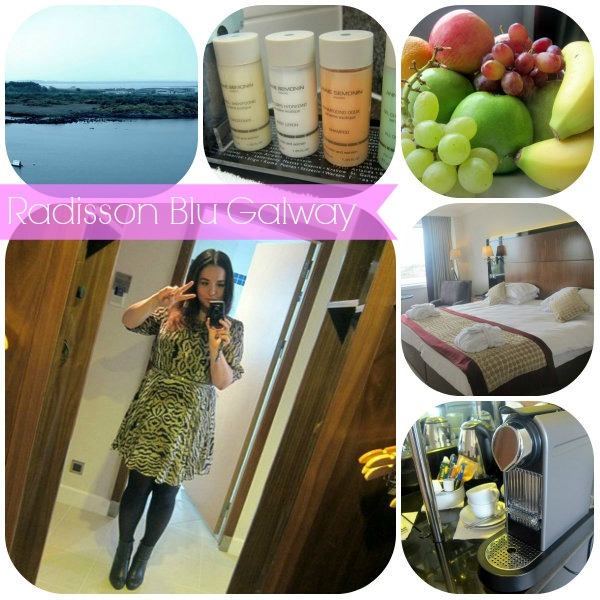 If you’re visiting Galway and in need of some serious R&R, the Radisson Blu should be your first port of call. In the immortal words of the last Governor of California – I’ll be back! An overnight stay at the Radisson Blu Hotel & Spa, Galway, can be yours from €95 per person, B&B.The Elemis Pro-Collagen Quartz Lift Facial is €95 for a 70 minute treatment. Fluff and Fripperies was a guest of the hotel. 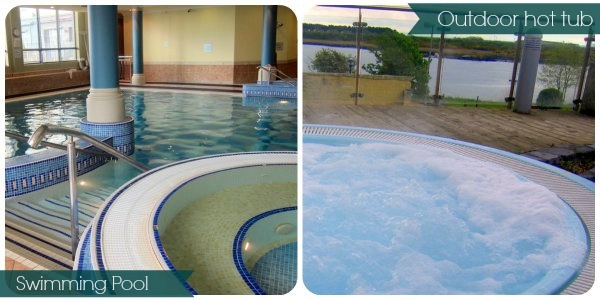 I'm so jealous of all these gorgeous spas you keep visiting Emma!!!!! I love Elemis products because they actually work & always smell divine. This place sounds amazing - love the sound of the outdoor hot tub! And who needs good weather when you have an indoor beach!! I love Galway! The prices actually seem pretty reasonable, will definitely check this place out for our next trip. You look fab! Where is this dress from?! We just stayed at a Radisson Blu for my bday. I loved it!!! This sounds so spectacular and relaxing, especially the thermal suite! Bliss indeed Emma! This was superb! I envy you doll! EVERYTHING looked fab. Glad you enjoyed yourself. Ooo lucky you! That sounds amazing and oh-so-relaxing! I've sadly never had a facial. I think I need to treat myself to one... And holy crap that product sounds amazing! 94% wrinkle reduction? Wowzers. Hosting an INTERNATIONAL GIVE-AWAY WITH FIRMOO. 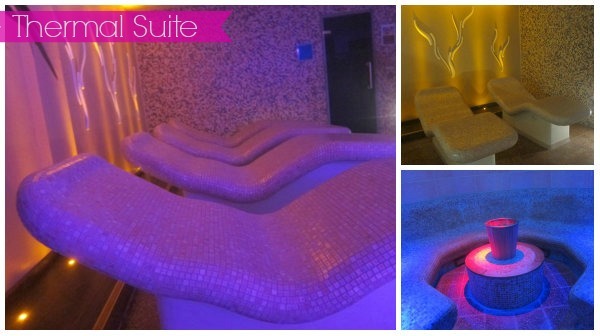 The thermal suite there is beautiful... so relaxing. I really want to try this facial now.